Event Display - 2019 MSPRA Annual Conference: Why is Everything a Crisis? 2019 MSPRA Annual Conference: Why is Everything a Crisis? 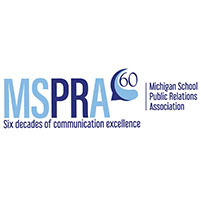 Learn how to spend less time in crisis mode, be more effective, and celebrate MSPRA’s 60 years of support for School PR Practitioners. Steve Knagg, known for his humorous and personable southern style, is an icon of our profession! After 33 years of service to Garland ISD in Texas, Steve gained a new perspective when he stepped back in the fray as a local school board member. He combines his sense of humor with common sense, practical and creative approaches to do what’s right for kids. Steve has presented across the country and is an NSPRA favorite. Kate Snyder, APR focuses her head and heart on creating communication that makes our world better for everyone. She is dedicated to uplift-ing women in business, she’s a passionate advocate for the arts, and she makes it her mission to ensure those without a microphone are heard loud and clear. Kate is a savvy PR practitioner and veteran strategist who inspires and empowers her clients to connect with their audiences and customers in new, dynamic ways. She writes and speaks about working with government, nonprofits and businesses about how to connect to their strategic goals and purpose to achieve measurable results for their work.